These early days of the trout season are some of my favourite times of the entire season, I love the early days the feeling of rebirth after the grey winter months were the rivers and its banks felt so lifeless and stark. The first shoots of regeneration reach skywards and the air fills with the hum of the first bumble bees and skylarks song. Up-wings lifting from the water, as the occasional wild flowers dot the banks with yellows and whites beneath the purple haze cast by the broadleaf trees ripe with buds ready to burst open, flooding the grey world with bright fresh green bathed in the new warmth of spring sunshine. It lifts the soul, putting a skip in your step and a smile on even a grumpy bugger like myselfs’ face. Start of the season its all about timing, you could fish from dawn till dusk but you could also beat your head against a brick wall, both have different outcomes but are equally as pointless. I have watched other fishers thrash the water and leave disheartened. You need to fish the window when the hatch is on, this tends to be a rather short 3 or 4 hour period over lunch from around 11am till 3pm, the warmest part of these spring days. So don’t be precious about a sit down meal at 1pm because that’s when the fishing is often getting good. Part of the real joy of the hatch at this time of year is the limited selection of what is likely to be hatching; Up-wings like LDOs (large dark olives), March Browns and occasional Brook duns. Grannom and Alders – members of the caddis family. We also see some stoneflies and midge and this limited number of species means fly selection becomes easier and its quicker to zone in on what the trout are feeding on. During these golden hours, regardless of whether you are fishing dries, nymphs or wets, the fish are far more likely to be switched on. I have seen it where arriving early on the river and not a fish is seen or taken till the hatch begins. Above or below the surface it truly is like a switch being thrown. What is hatching? As I said before at this time of year certainly in Northern Scotland it is a select group of flies that we tend to see, but you must be aware there is always a regional variation in time of year and the species that will be hatching. In North East Scotland we are several weeks behind the South of England and invariably the magazines and social media chatter begins announcing what is likely to be hatching and people are catching on; “LDOs”, “Grannom have started”, “oh the first Iron blues”. But don’t assume that mean your stretch river 300 or 400 miles North is seeing these species hatching at that time, remember it is vitally important to see what is actually hatching! Don’t presume! It is also important to factor ineather, remember it’s one of our mainstays as conversation in Britain, this year it’s a key point in fact with a mild winter and warm March things are most certainly further on than usual and in some cases by as much as 2 weeks plus. So be prepared, as with everything in nature there is variation so you have to get out there and observe. Maybe the name LDOs and March Browns are just gobble-d-gook to you or maybe you have heard them before and want to improve your knowledge of the invertebrates we find in our rivers and lochs! Well there is help at hand there are two great wee books, a couple of invaluable websites and a new App that every flyfisher should have to help them with identification of what is hatching and when through out the year and what imitations best suit. Particularly Matching the Hatch by Peter Lapsley for those new to flyfishing who need that little bit of help and confidence to choose the right fly to imitate the hatch. Its simple, easy to use and small enough to slip in the fishing vest or wader pocket. Above all use your eyes! nothing beats getting out there and exploring the entomology of the river. What’s in the water, what’s in and on the surface not forgetting what is also on the bank and in the air above, better known as terrestrials. Turn over some stones in the river and actually see what invertebrate life is there it can sometimes be wonderous what you find. I carry a small aqautics dip net and a wee Tupperware so I can rootle around under and among the stones of the riverbed. It produces a wealth of information that is incredibly insightful, helping inform my choices and adding to my knowledge of what species are present, every day fishing is a day learning. By taking the time to do these searches I found that I became far choosier in my fly selection, more confident in my choices and I saw a distinct improvement in catches. Never was a statement truer than “ imitation is the greatest form of flattery” I truly believe imitating naturally what is hatching will produce greater results. Take your time its not a race! What is the point in dashing from the car to the rivers edge jumping in and wading waist deep, chucking fluff or tungsten in every directing with the blind hope that a brownie will take? Explore! Walk and explore the stretch of river, too many fishers never fish more than 100 yards of the car park, laziness. Yes you will catch fish if you are lucky, but you may well be missing better fishing else where and half the fun of wild brown trout fishing is that sense of exploration, fishing the spot less fished. Now breathe and take some time to just look and listen! Watch the water, look for foam lines; trout feed here. Just as the current has funneled and ”trapped” the foam in these lines so will it trap food items, hatching and spent fly life. Watch how the water moves and how it is likely to act upon your fly, leader and line. Above all, watch for rising fishing, thats what we are here for! Quite often a rising fish by its rising reveals whether it’s a tiddler or a bigger fish, maybe even that lunker of a lifetime. 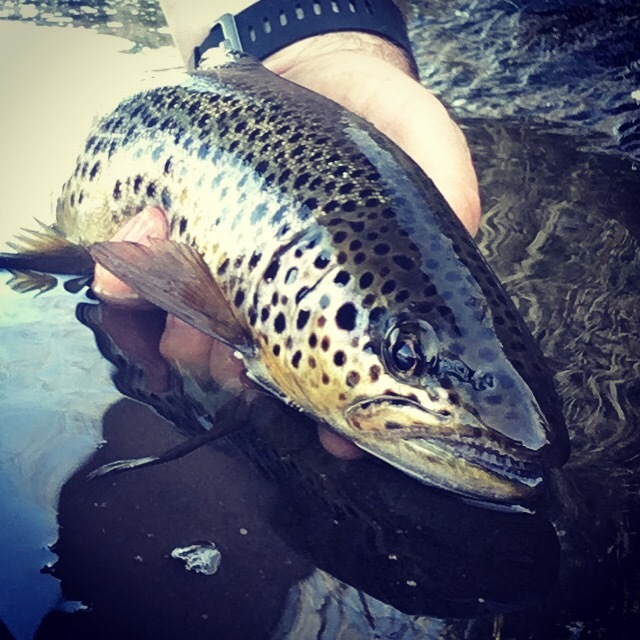 It’s not a foolproof clue and the best of us have been disappointed by the tiddler masquerading as a bigger brother, and equally surprised by what we assume is a modest brownie; but on sipping down the fly runs striping you to your backing, with a fight of your life on a 3wt rod and turns out to be a 7lb slab of gold. So we watch the the water, there is a hatch starting and now the occasional trout blipping taking the hatching Up-wing or Grannom….deep breath and lets just wait a moment longer wait till the brownies are taking confidently and regularly, you can watch as the same fish repeatedly rises, taking flies from the surface. When they are feeding consistently and focused on feeding the chance of a good take is now increased. I rarely cast a line till the hatch is properly under way and the fish are rising with confidence, it makes targeting of fish easier and often proves more successful. I could talk longer still about tackle choices, weight of rod and line and of course, diameter and length of leader and tippet but I try not to bore the reader completely to tears. Quite often you will find a perfuse hatch happening and the accompanying rising trout on an isolated stretch of the river or the hatch restricted to a particular pool yet down or upstream there be no hint at all of a hatch happening so keep moving and you will reap the reward. After all we are fly fishers; not course fishers sitting on their backsides for hours on end. This early season really can be a time of plenty and good sized trout and after a long winter, casting a fly to a rising trout is truely magical.